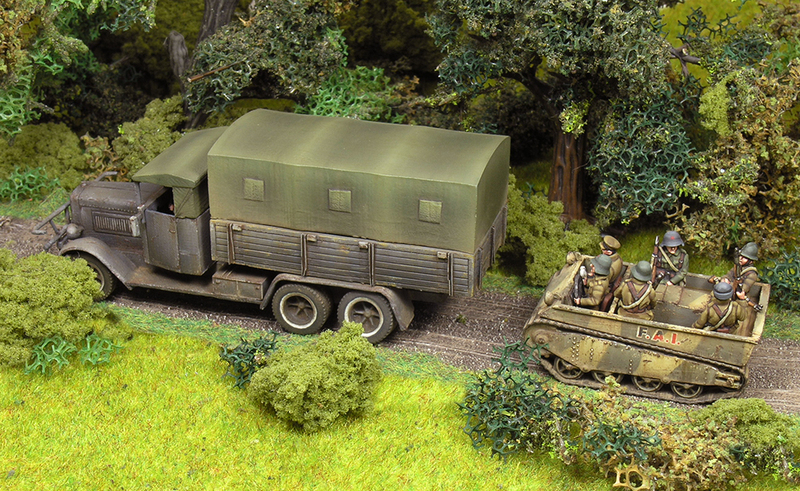 Some times, specially when we are painting trucks, we have to paint big canvas surfaces. And obviously, we cannot paint the canvas texture in the same way we paint a painted metal surface. 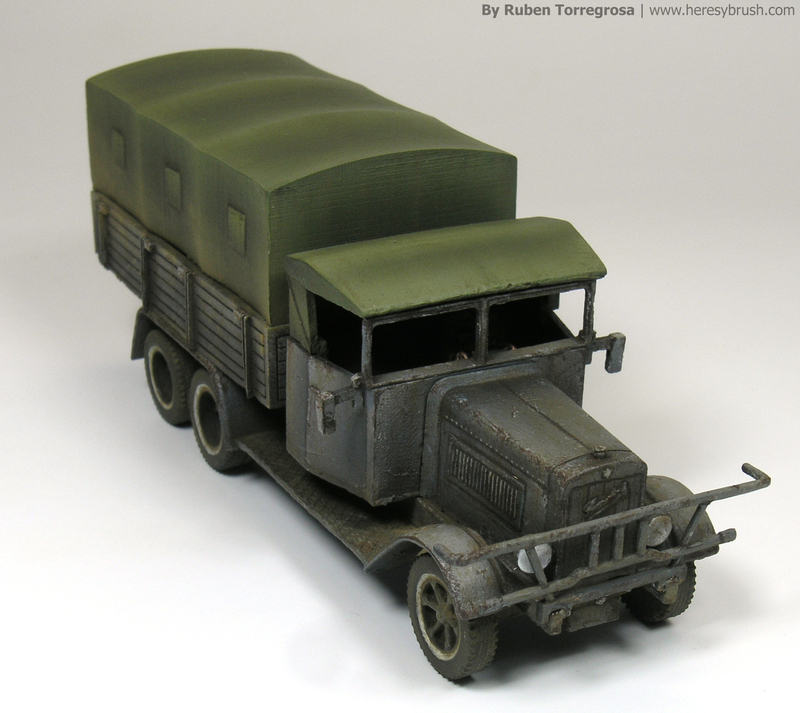 Here we try to explain a very simple method to paint canvas with a real look. 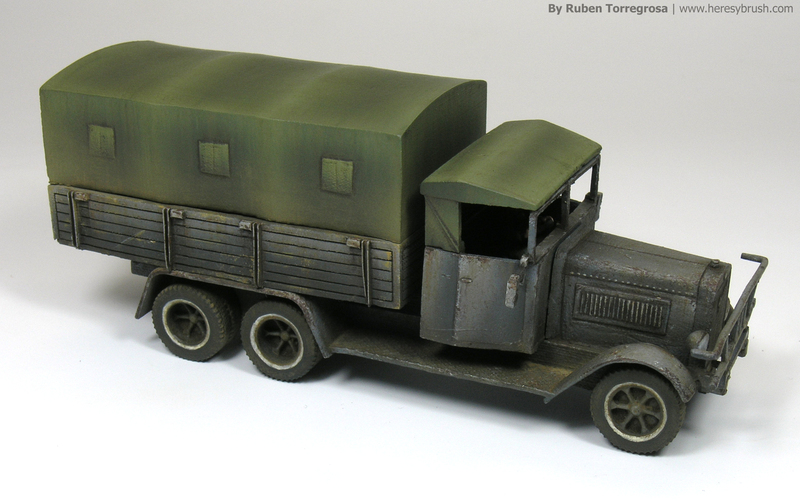 In this ocassion I will use a Henschel type 33 truck from Minairons Miniatures in 20mm (1/72 scale), painted following a Spanish Civil War and early Second War World scheme. 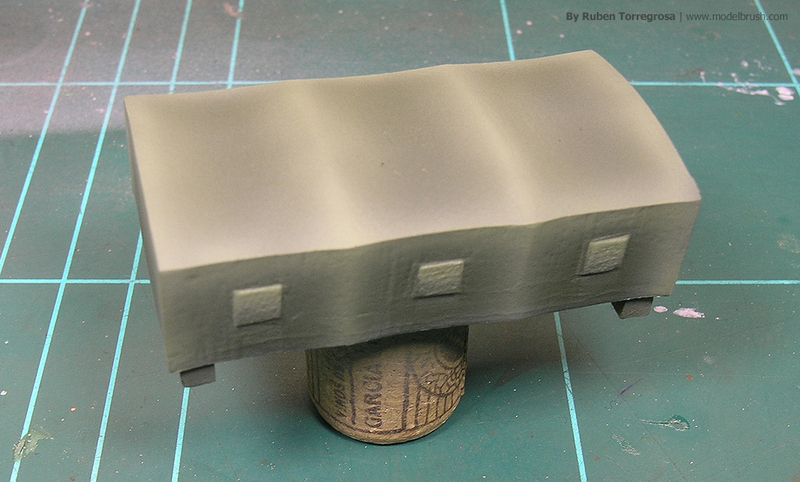 That is, grey color for the track and green for the canvas. 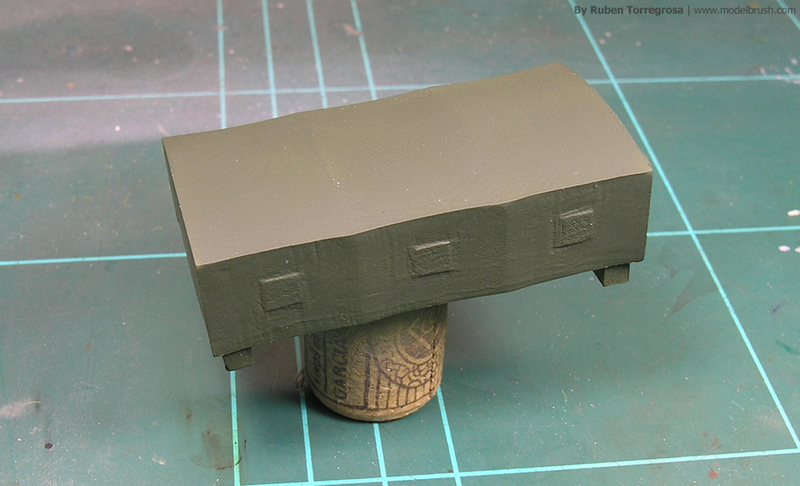 First, after priming the model, we paint the canvas in green color. 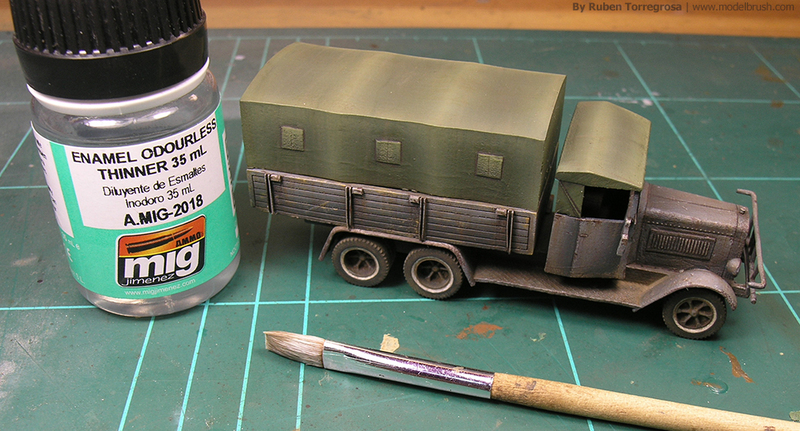 I have used XF-58 (olive green) from Tamiya, diluted with some drops of isopropanol. Apply as many layers as you need to cover completely the surface. Next step is probably one of the most complicated when we are painting canvas: what kind of illumination we should use?. It is an important question, since if you apply an incorrect illumination the result can be totally irreal. In my case, I decided to apply in some way a panel lighning-like ilumination, where I apply the light on the superior sides (on laterals) and on the sites where the metal supporters of the canvas are placed. I only applied two lights, using white. It is better if you dilute a bit more the paintings when you are applying lights, since the gradient effect will be smoother. 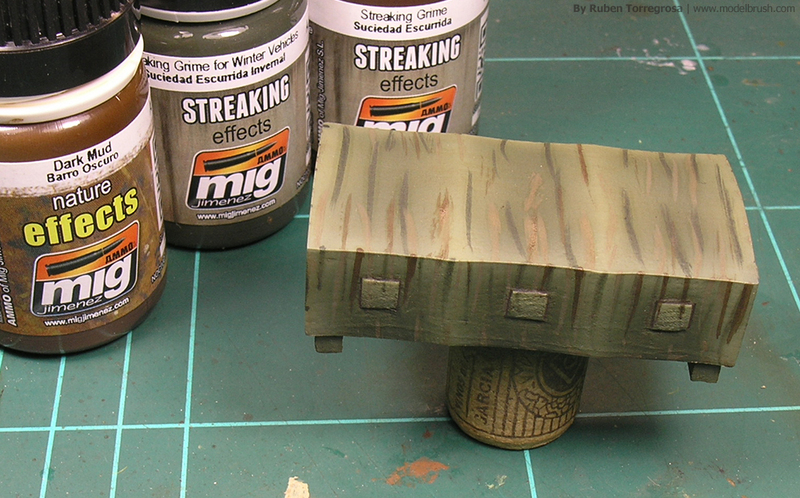 After applying a varnish layer, it is time to apply some weathering effects. I decided to apply some streakings effects from Ammo of Mig Jimenez in order to achieve some streaking effects (of course), but I mainly used them to change a little the general tone of the canvas. That is, usch as a filter.I simply applied some stripes of different tones throughout the whole surface. After waiting some minutes, I blended the stripes using a moistened brush with White Spirit or turpentine and with vertical strokes (therefore you can achieve the striking efects). The superior horizontal part was treated in a similar way. Finally, I used some pigments to integrate completly the canvas with the rest of the track (thanks Miguel for the advice!). I use them directly from the jars, but first I mixed different tones to get a more realistic result. TThen, I scattered them only on the lower part of the canvas’ laterals. 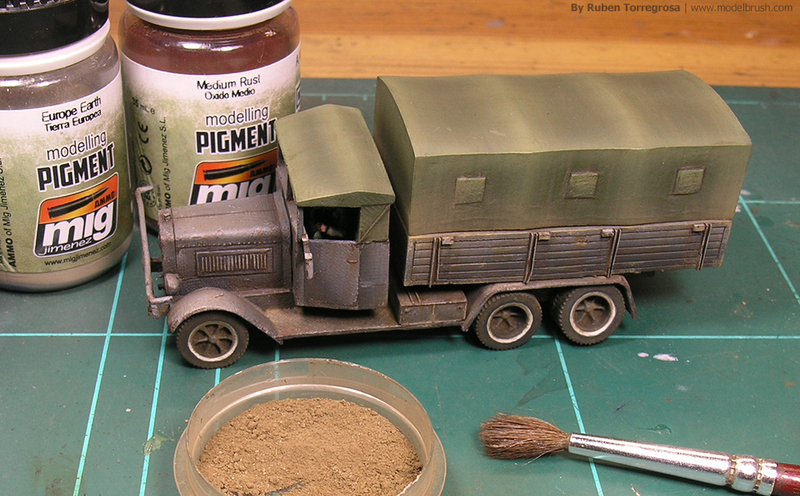 Of course, I have used pigments because the rest of the truck was treated with them. 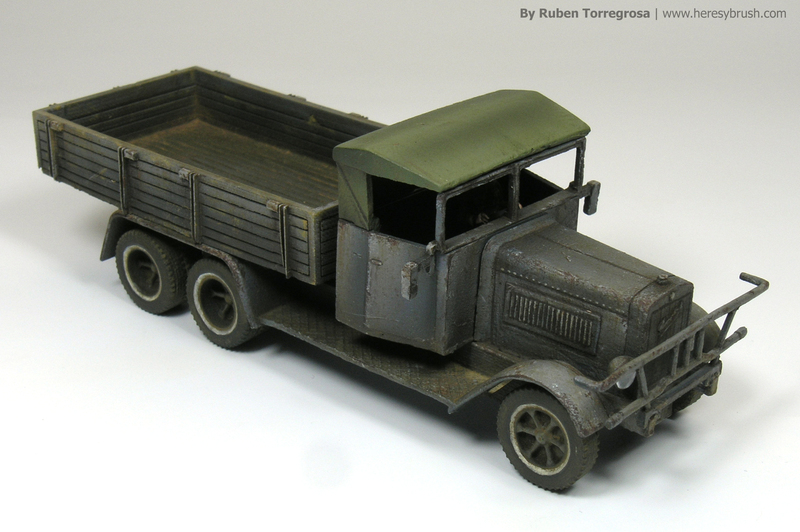 But if your vehicle doesn’t have dust (pigments), then you shouldn’t use them on the canvas!. The idea is to treat all different parts of the vehicle in the same way.